This investigation began in August of 2016 as a result of FWC enforcement efforts concerning spiny lobster trap and trap tag violations. At that time, three separate cases resulted in 347 misdemeanor and 64 felony charges against the suspects. A deeper look by investigators into the suspects’ records and history revealed numerous discrepancies with trap tag transfer surcharge fees, suspicions of identity theft, forgery of official documents, false notarization of documents, and the falsification of Crew Share Statements (a method of proving that a significant portion of one’s income comes from commercial fishing). Those discrepancies led investigators to broaden their scope and look into the activities of Elena Reyes. 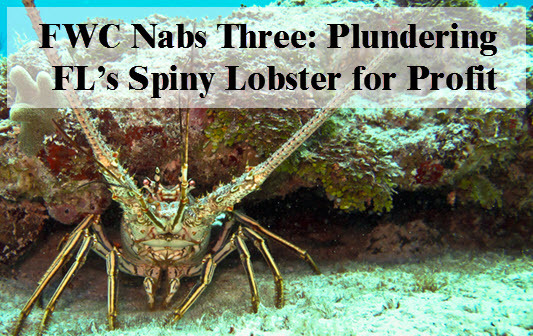 Three individuals were charged with numerous felonies, including racketeering, conspiracy to commit racketeering, organized scheme to defraud, criminal use of personal identification, and official misconduct pertaining to the sale and transfer of Spiny Lobster Trap Certificates, as well as obtaining Restricted Species Endorsements on Saltwater Products Licenses. The primary suspect in the case, Elena Reyes, owns and operates Florida Marine Fisheries Consultant, Inc. She allegedly created a far-reaching scheme that defrauded the State of Florida out of hundreds of thousands of dollars, enabling others to illegally receive commercial fishing licenses. The identity of one of Ms. Reyes accomplices is protected by F.S. 119.071(4)(d). It is not clear why FWC did not reveal the title of the alleged offender. This is not protected by the statute. Investigative work, including undercover and surveillance operations, revealed that Ms. Reyes was reporting a sale price much lower than what was actually paid, usually by $100-$200 per tag. It is alleged that this scheme saved her clients roughly $200,000. In addition to misreporting sale prices, Ms. Reyes also used commercial fishing licensees’ personal information to falsify Crew Share Statements on behalf of others. Throughout the years, she created more than 200 falsified Crew Share Statements. Sixty victims of this criminal conspiracy have been identified so far. The Attorney General’s Office of Statewide Prosecution will prosecute the defendants. In addition to FWC resources, other agencies involved in this operation included the Department of Homeland Security, Florida Department of Law Enforcement, NOAA, U.S. Fish and Wildlife, U.S. Customs and Border Protection, and Monroe and Miami-Dade County law enforcement agencies.